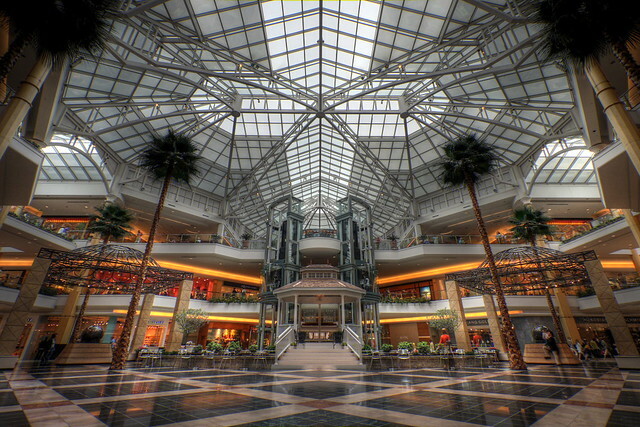 Somerset Mall Atrium | Flickr - Photo Sharing! Enjoy my art? Visit the Shane Gorski Photography Store and enjoy it in print! The paradise of spoiled teenagers, wives of the upper class, and annoying toddlers... Somerset Mall in Troy, Michigan! I needed something to do Sunday and I haven't taken some pics in a long time and this venture brought my Canon 30D to 13,000 shutter fires.. whew! JVLIVS Photography, retake, SA_Steve, and 8 other people added this photo to their favorites. man, this one is cool too. You shooting at like 14mm or something? 10mm on a Canon 30D is equivalent to 16mm on full frame. Rock and roll. You rocking 10mm!!!! Suuuweeet shot Shane!!! Very cool lines, tones and lighting! Nice shot, I like this subject..
Add This Photo to : ANY HDR. oh sweeeet jebus. do you see the demon face? NEWS! I found out that using the PT LENS plug-in for distortion correction adds significant purple artifacts along edges in 16-bit TIFF files. This is why this image is not as sharp as my other wide angle shots. WATCH OUT! Shane .. love this symmetrical shot .. well composed indeed! THAT IS SO WICKEDLY COOL, MAN! Is this HDR? Hi, I'm an admin for a group called Engineering as Art II-Voting *, and we'd love to have this added to the group! Hi, I'm an admin for a group called Photography for Architecture and Interior Design, and we'd love to have this added to the group! Wow! A great shot with great perspective! And we would like to say thanks for putting your photo up with a CC license, enabling us to place it at our site to show English language students along with a bit of text. Your photo was part of our topic of the week page and we are emailing now to say thanks. Yes, that was a number of months ago that we put it up. Still, better late than never.... You can see the photo at aaronlanguage.com/weekly_English_topic/129_june_7_2009.htm. Your name is under the photo, which links to our credits page at aaronlanguage.com/credits.html. Your name there links to your profile here at Flickr. Thanks for sharing. I've used this in an article here: cruncher.hubpages.com/hub/The-pros-and-cons-of-investing-... with attribution.